Spain Train Crash on CC Camera. The Santiago de Compostela derailment occurred on 24 July 2013 when an Alvia train en route from Madrid to Ferrol derailed just before reaching Santiago de Compostela station. Out of the 222 people (218 passengers and 4 crew) aboard, 78 people were killed and 140 were injured. Unofficial technical reports disclose that the train was traveling at over twice the posted speed limit when it entered a curve. According to the Madrid daily newspaper El País, 78 people were killed and 140 injured. The Santiago de Compostela derailment was the worst train accident in Spain since the Torre del Bierzo rail disaster in 1944, and the first ever on a high-speed track in the country. 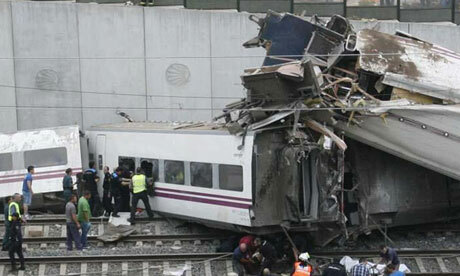 Compartir el post "Spain train crash"